Our very best 1200D-Denier/BEST AVAILABLE/FOR TRAILERING OR STORAGE. Most boat covers on the market are 150 to 600 Denier. This is our very own top of the line Vortex 1200D Marine Grade Polyester Cover. This is our most rugged and heavy duty cover yet. It is the best of the best. You spend good money on your boat....fuel, oil, maintenance, repairs, etc, and it is well worth it. It is part of the pride of boat ownership, and we understand that. We are boat people, too! This cover offers an upgrade over our 600d cover, in that the material is thicker and heavier duty. These are for folks that want the best cover that they can get. It is difficult to judge or predict how heavy duty a boat cover is, as there just are so many factors. But, the key factor is the 'd' or 'denier' 'rating'. Denier is a direct indicator of the thickness of the material. Therefore, it is an indirect (but accurate) indicator of how 'heavy duty' the cover is. Now, the industry standard seems to be 200d or 300d. You will even see some 150d covers. These lighter duty covers are generally what the big box retail stores, mass merchandisers, and huge marine mail order outfits sell. We do not take that approach. The absolute minimum we carry is a 600d, and they are fantastic. We have sold tens of thousands of them with solid warranties, and warranty issues are just almost nonexistent. Now, to explain the 'denier' number in more detail, the 'd' or 'denier' rating is much like a thread count on a bed sheet. The higher the number, the thicker and heavier the material. Preventative maintenance often seems expensive, but it almost always more than pays for itself quickly. As a preventative maintenance tool, these cannot be beaten. These are waterproof, and 100% UV proof. The UV protection is often overlooked, but when you see a boat with cracked/weathered seats, the sun did almost all of that. The idea of having a waterproof cover is important, but the UV protection is almost always more important. These provide water protection, sun protection, leaf protection, bird protection, etc...just the best protection against nature in general. Have a look at our covers, and if we can be of any additional assistance, feel free to call us at 1-800-309-5190. We will be glad to help you. If you are considering buying a boat cover and you are confused about what is out there, you owe it to yourself to read through this. Whether you buy from us or not, this will give you a good understanding of what is out there. Reading this could very well save you many hours of researching, thinking, and sorting information about boat covers. It also may save you many dollars. Reading this will help you make an educated decision concerning what boat cover you want. Again, whether you buy from us or not, if you are potentially in the market for a boat cover, you owe it to yourself to read this. It will only take a few minutes. We appreciate you taking the time to look. First of all, there are hundreds or maybe thousands of brands and types of boat covers out there. We have studied these extensively, and they can be grouped into 3 general categories of covers. 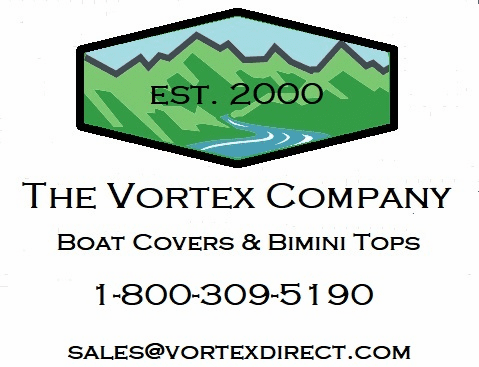 Our new Vortex Boat Covers are semi custom covers and have many important advantages over almost any other cover out there, besides the price. 1. 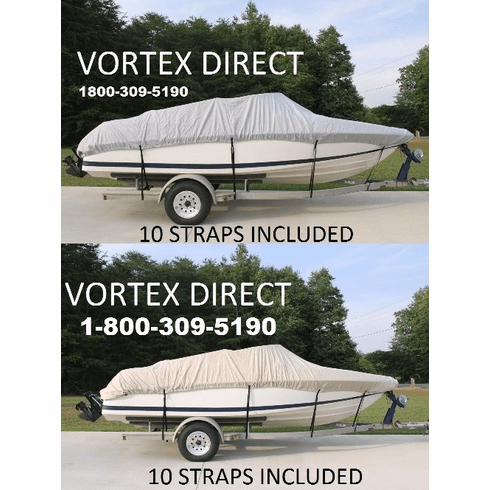 Vortex 1200D Boat Covers are suitable for storage, mooring, or trailering. Many covers are made for a specific type of use. Ours are made for all 3. 2. Vortex 1200D Boat Covers have the best strap system available. Research has shown that straps over the top and completely under the boat do very little good. (Also, ever crawled up under a boat on a trailer to run straps? Ever bumped your head under there?) Our covers are made with a new system whereby a series of loops is sewn to the fabric and the strap goes through that loop, around your trailer, and snaps together..very very simple and very very strong. 3. Vortex 1200D Boat Covers do not have grommets to scratch your boat. 4. Vortex 1200D Boat Covers have an elastic rope sewn into the hem..to help hold the cover tightly to your boat. This is very nice for mooring. Say you have your boat down at the dock and just want to cover it temporarily. Most likely, you would not need straps, etc for such a project. The elastic will hold it in place. Then, for storage or trailering, you can fasten the straps for a more secure fit. The elastic makes putting the cover on the boat much easier. It makes it a very easy 2 person job, and a reasonably easy one person job. 5. Our Vortex 1200D covers are made from marine grade canvas that is proportionally 4 to 8 times as thick and heavy duty as most covers out there. A good boat cover will pay for itself many times over in terms of protection of your investment. The general idea is to protect your boat from the elements (rain, snow, sun, etc. ) The function of a cover is to take the abuse from the elements that is normally destined for your boat. Our covers are good for performing that function in 3 main areas (mooring, storage, and trailering). A good cover will pay for itself very quickly. Consider the time put into a thorough cleaning, maybe for the first outing of the spring�.That several hours of cleaning could have been avoided or greatly minimized by use of a good cover. Within these, we have 600d and 1200d covers. TYPE 2: We carry covers for v-hull type boats, generally, boats that are pointed on the front, and square on the back (fishing boats, runabouts, fish/ski, etc) . Within these, we have 600d and 1200d covers. For our Vortex Boat Covers, they are sized like this. We carry several lengths (currently 14�, 16�, 17 � �, 19�, 20�, 22�, 24�, 26� and 28�) Each size will fit up to a certain beam, as listed above, in the title or heading of this listing. That beam is standardized based on industry standards of lengths and widths of boats. At the given beam that a cover is made for, it will cover that entire beam, plus about a foot down the sides all the way around. For example, our 19� cover is for up to a 96� beam. So, if your beam is 96�, the cover will cover the top of the boat, and down the sides about a foot all the way around. If you boat has a 90� beam, then you can expect the cover to cover the top, and a little more than a foot all the way around. If you boat has maybe a 102� beam, then the cover will cover the top, and a little less than a foot all the way around. There is some flexibility, and the given beam is ideal, but is not an absolutely vital number.